Reverse factoring (sometimes called Supply Chain Finance) is a financial facility that a large company can arrange with a financier, providing a factoring service to some or all of their suppliers. It turns the whole factoring model upside down. Instead of individual suppliers having their own facilities, the substantial debtor puts in place an umbrella arrangement that benefits all (or some) of its small suppliers. The involvement of the large purchaser / supplier, such as a supermarket store chain for instance, means that the facility attracts much finer rates than the individual suppliers will be able to achieve on their own account. This can make the cost of the facilities much cheaper for the users. Furthermore, the individual suppliers do not need to have a great credit rating in order to qualify for the service, because of the involvement of the substantial customer. The facilities are based on the strength of the large debtor. There are advantages of reverse factoring delivered to all parties involved. The large purchasing organisation receives a period of credit to pay for supplies, whilst knowing that their suppliers are receiving immediate payment against their sales invoices. 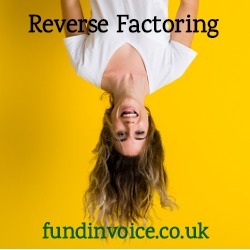 The debtor's suppliers don't need to source their own funding arrangements, as they can benefit from a cheaper reverse factoring facility on account of the customer that they are dealing with. This can save them a lot of money in charges. The charges, such as the interest rates will be lower than the suppliers are likely to be able to achieve on their own account. Suppliers may be able to qualify for an early payment discount, as they are effectively paying immediately. These facilities can attract higher funding prepayments than would normally be offered, and online invoicing systems are often used to manage the transactions. The biggest disadvantage of reverse factoring is that you are tied into using a facility that is predicated upon the customer that you are dealing with. Some small suppliers prefer to have the independence of having their own funding arrangements set up.